A recent sit-in at the office of Minority Leader Nancy Pelosi (D-California) has brought national attention to the Sunrise Movement’s push for a Green New Deal, which prods the US to move to 100% renewable energy by 2030. 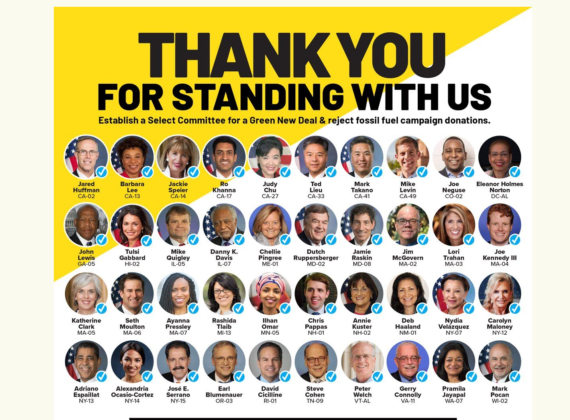 With goals to reduce emissions through massive, rapid deployment of zero-carbon generation, the Green New Deal is gaining momentum, with 40 members of Congress already signed on and more Congressional representatives committing to the effort every week. The Sunrise Movement’s advocacy for a select committee to sponsor the Green New Deal is growing even in the slow holiday period at the end of 2018. With an ability to both mobilize large numbers of youth and to remain in the media spotlight, the Sunrise Movement’s success is, in no small part, due to its charismatic backer, US Representative-elect Alexandria Ocasio Cortez (D-New York). Ocasio Cortez has written text for a proposed addendum to House rules for the Green New Deal, which continues efforts she called for in her campaign. The group of representatives supporting this call is much more diverse in terms of race, ethnicity, and gender than the largely white Protestant male Congress. Several of the signers are children of immigrants, people of color, or women. 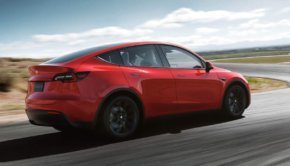 The endorsements also stretch geographically across much of the US, with representatives from the East Coast, West Coast, Midwest, and even the US South joining in. Wind and solar energy are now less expensive than the polluting oil, gas, and coal of yesterday, the Sunrise Movement argues. They say that, if we stop wasting billions in taxpayer money giving handouts to oil and gas CEOs, we can halt climate change and create tens of millions of jobs by upgrading America’s outdated infrastructure. We could enter a new age of prosperity and health and bring forward the people this country has left behind. The Sunrise Movement has outlined a strategy to gain support for the Green New Deal. Get a critical mass of members of Congress to support a Select Committee for a Green New Deal. We already have 40 in just 5 weeks. In January, make sure the next Congress puts the Select Committee in motion. Use the next year to write the best Green New Deal bill possible, and organize candidates and people across the country to support it. Join with other movements for change to elect a President and a Congress that will stand up to fossil fuel CEOs and pass a Green New Deal to transform our economy within the coming decade and offer a job to every single American who wants one — no matter the color of your skin, where you live or where your parents are from. What Do the Voters Think about a Green New Deal? 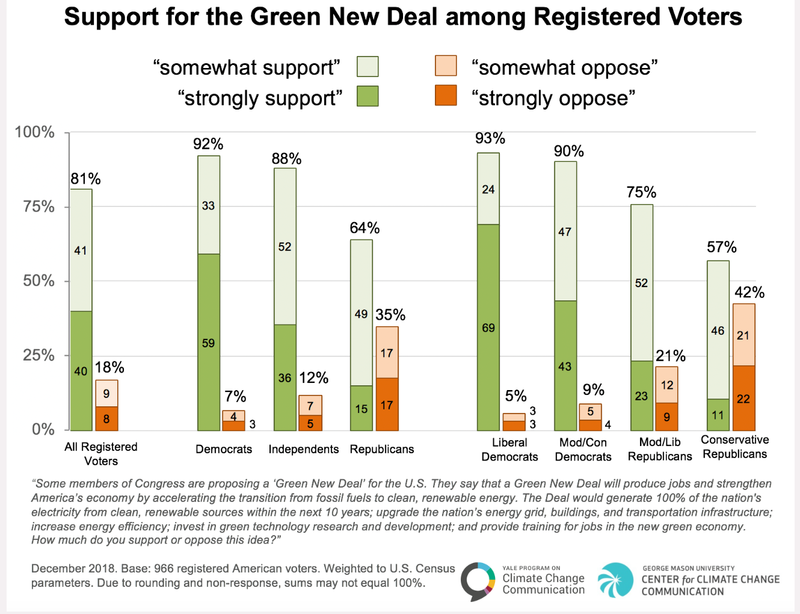 The rise in Congressional support is commensurate with the popularity of the Green New Deal with voters. A recent Yale Program on Climate Change Communication survey shows support is strongest among Democrats (92%). 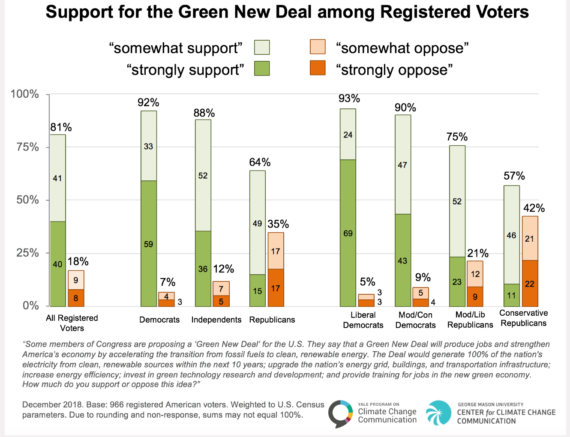 But a large majority of Republicans (64%) – including conservative Republicans (57%) — support the Green New Deal policies in principle. Why Do We Need a Green New Deal Now? Calling for climate leadership to set the US a new path, this outreach to elected officials on behalf of the Green New Deal seeks bold action to protect public health and create hundreds of thousands of jobs in energy efficiency and clean energy like wind and solar. Bringing in new and former fossil fuel industry workers to the clean energy economy of tomorrow is essential as part of the Green New Deal to reduce pollution while also expanding opportunity. Originally promoted by author and non-profit founder Van Jones, the Green New Deal has been on the platform of the Green Party in several presidential campaigns. The call for 100% renewable electricity by 2030 earlier in 2018 was backed by a small group of mostly incoming members of Congress, coming from the far left of the Democratic Party. With the looming climate crisis, bi-partisan support has been growing and is seen as a solution that can benefit multiple constituents. The Gathering at the recent Sanders Institute framed the Green New Deal, for example, and its green growth strategy as an efficacious solution for Puerto Rico’s infrastructure crisis following last year’s 2 hurricanes. The advocacy of the Sunrise Movement, led by Alexandria Ocasio-Cortez, which includes a proposed Select Committee for a Green New Deal, has the potential to transform the US economy and society at the scale needed to stop the climate crisis.